"They handled all of the "difficult" parts of travel so that I could simply show up there and have a life-changing experience." "Top notch trip planning, attentive hosting, adventuresome guiding, and the best ski instruction available. Jon and Sharon run a great program that I can't recommend enough." "Why is a Zelement ski trip a great time? Top notch trip planning, attentive hosting, adventuresome guiding, and the best ski instruction available. Having joined trips in the US and Japan as well as on-resort ski lessons, every event was exciting, well run, and beyond expectations. Jon and Sharon run a great program that I can't recommend enough. Sharon tunes in to her guests and then works the back end logistics so that even the spontaneous "wouldn't it be cool if" items seem carefully planned. When you muse about something over happy hour, and then the next morning it's all planned and ready for you...that makes for a great vacation. She makes it look easy, and that makes for a fun trip where wishes come true. Jon has a life-long passion for skiing and it shows every minute. Whatever Mother Nature (or Ullr depending on how you roll snow-spirit wise) brings, you want to get the most out of it. 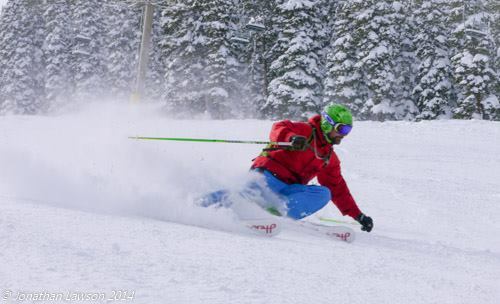 Jon has both the classic training (as an instructor-of-ski-instructors) and the guiding experience to craft an experience that finds the "goods" and ups your ski game. Whether you want to charge untracked powder in the backcountry all day, work on the finer points of tree skiing, or just play around in your comfort zone, Jon will tailor a ski experience that keeps a smile on your face from first tracks to last chair. If you're looking for something out of the ordinary, away from the corporate packaged 'experiences' - go freestyle, go with Zelement!" "Sharon and Jon are inspiring others to live out their dream life as they live out theirs, proving that you don’t have to prescribe to the rules and the norms that are set for us by the societies we live in. " "I typically don't do group or organized travel, but like many of us - I have long hours [so] we put our trip in Sharon's hands. It was wonderful. She also has been an overworked American and a traveling expat so she seemed to know just what kind of itinerary, communication style, and trip support I was looking for." From Day 1 - when I first sent a feeler about the travel - until today, long after our trip, Zelement has been fantastic. I typically don't do group or organized travel, but like many of us - I also have long hours, and certainly organizing logistics for a group of friends can be a headache. Our group was five 30something women from NY and CA, and we put our trip in Sharon's hands. I sent her our parameters in terms of people who may join, dates we were considering, etc. and she handled everything. Every detail was handled in advance, or by Sharon and Jon day to day while in Canggu. This means yoga, massages, surf lessons, motorbike rentals, cooking lessons - everything. You were encouraged to explore on your own and given all the tools to do so, but they were also there to handle every question, every reservation, etc. It was wonderful. Sharon is incredibly communicative, informative, patient and just a joy to work with. Sharon has lived in & traveled around Bali. She knows Canggu and the broader island - people, places, culture, food, surfing, etc - but she too has been an overworked American and a traveling expat, like us. So she seemed to know just what kind of itinerary, communication style, and trip support I was looking for. Our stay at the Zelement house was simply idyllic. It makes me consider other group / organized travel - but I fear no experience would live up to what Zelement offered us." "It's nice to not think about the details and just know you are signed up to be somewhere exotic learning how to do something new and will meet friendly, like-minded people along the way." "They are easy going, joyful lovers of life and live with enthusiasm, you won't regret joining them at Zelement Club! I highly recommend it." "I had the delightful opportunity to meet Sharon and Jonnie during a workshop at The Practice, Bali in June 2016. I was instantly drawn to them because of their warmth and openness. Sharon and Jonnie are doing what's natural for them with this special gift they both have: Bringing conscious, like-minded people from all over the world together who seek adventure, travel, new experiences, yoga, surf and expansion. They are easy going, joyful lovers of life and live with enthusiasm, you won't regret joining them at Zelement Club! I highly recommend it." "Experiences over things. That's the mission statement for my wife and me. We took our first international within a year dating. We have been fortunate enough to visit a variety of places and now that we have a child we've started introducing her to the beauty of the world. Over the past few years our travel focus has shifted to make sure that we augment our journey with unique experiences. Things like biking Croatia, Slovenia, getting married in Nicaragua and doing a self-driven safari in Namibia. Hands down the best experience was the JaPow tour we did with Zelement in February 2016. Zelement is all about the experience! The attention paid to maximizing the client experience is a game changer. This isn't an anodyne thing. Most people go to Japan and go to Sapporo, which offers a resort experience familiar to most westerners. Instead Zelement took us to Myoko, which is blessed to be within 30 minutes' drive of 5 amazing resorts. The small town atmosphere created a cozy experience and enhanced group camaraderie. On the slopes the highlight for me was the day spent carving through knee deep powder, with 20-30 other people at a two lift resort. Calling it an intimate ski resort would be an understatement. The woman that sold us our lift tickets in the morning was also preparing lunch at the cantina. There was also the day that half the group spent with Jon and Sharon doing tree laps, learning how to properly ski the trees. Before this trip I already loved Japan and I already loved snowboarding. Now I love both even more and have been trying to figure out how quickly we can go back. Zelement made this a trip to remember. If you're looking for an experience beyond that of flying from point A to point B and taking selfies, try a Zelement Adventure." "Jonnie gave us the tools to be the best we could be in teaching and skiing and yes, being the best people we could be. He made each one of us feel that we were special and quickly drew from each one of us what it was that made us better at our craft." "In 2015, I received the MVP Award at Loveland Ski School’s end of ski season banquet in our Adult Ski School Program. While honored and humbled by this award, I knew that it was the product of the incredible people that I have had the privilege to know and work with in the ski instructing world. Jon Lawson, (aka, Jonnie Law! 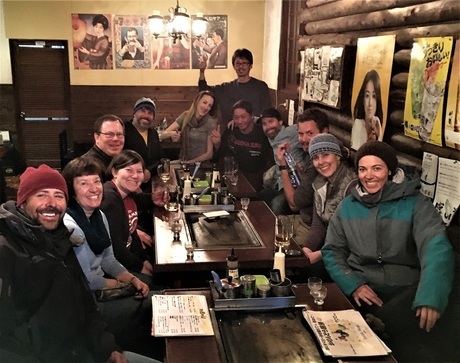 ), came to our Ski School as an Instructor and Trainer in 2010 and made an immediate impact on our School and those of us who aspired to a higher level of understanding and advanced professional certification in this crazy wonderful world of Ski Instruction. I trained and skied with Jonnie for 2 seasons and remember the great fun we had in his clinics. Jon’s clinics were always exciting and rewarding. He gave us the tools to be the best we could be in teaching and skiing and yes, being the best people we could be. He was a great role model. He made each one of us feel that we were special and quickly drew from each one of us what it was that made us better at our craft. When I passed my 3 day, “on snow”, Level 2 exams in February 2011, with high scores and “flying colors”, the first person I called to report my success and to thank was Jon. These days, when I get together with my ski colleagues after a day of teaching and we talk “shop”, I often hear, “well, Jon said this about that”, …and someone will invariably say…”wow, Jon was great at that”. I think because of Jon’s influence and training, a number of his original core student instructors from Loveland are now PSIA Level 3, or soon to be Level 3 Instructors. "As an avid skier I have had the opportunity to work and train with many exceptional ski instructors over the years. But there has been only one that truly stands out: Jonnie Law. Of course he has the solid technical knowledge of skiing and exceptional physical skills, but what truly sets him apart from others is his ability to teach. No, do not expect speeches on the hill full of technical jargon. That is not the way Jonnie teaches. He has a great ability to identify the one thing that will make the biggest positive impact on your skiing. Then he succinctly explains it in a way that makes sense to YOU. That can encompass demonstrations, drills, or just a mental focus for your skiing. His confidence in his clients’ abilities and truly individualized feedback bring the best skiing out of everyone. He is very passionate about the sport and genuinely wants everyone to succeed and achieve their best while also having fun. Basically, if you ski with Jon you are pretty much guaranteed to have an awesome time." "One of Jon’s best traits is to make a connection with those who ski with him. If you ever have a chance to ski with Jon, my advice is to make it happen. Your skiing will improve and you will have so much fun, you will want to ski with him every day." ​"I first met Jon Law in 2007. We were both ski Instructors at a Colorado ski area. He was the designated Trainer of our staff. I was training for my PSIA Level One exam at the time. He helped me prepare for this exam well, as I passed the exam with flying colors. Jon was always spot on with his technical facilitation of advancing our skiing. He was a perfect image of what skiing should be at a high level. He could ski at this high level in all terrain. I trained with him on our area demonstration team for an upcoming international competition. Although Jon was not the captain of the team his leadership skills were apparent from the beginning. After skiing with Jon for two seasons I can say he inspired me and grew my already high level of love for the sport. I have since grown my professional ski career to fulfill a dream to Coach Alpine ski Racers and to grow my Ski School career to the point I can call myself a professional skier and make a living at doing what I love - I never feel like I am at work. One of Jon’s best traits is to make a connection with those who ski with him. If all you do is observe his skiing one would improve. If you ever have a chance to ski with Jon, my advice is to make it happen. Your skiing will improve and you will have so much fun, you will want to ski with him every day. Jon Law is a Special Skier and man. Thank you Jonnie Law for being a special part of my skiing family." "Zelement Club is travel as it should be, ideal for the independent person who enjoys spending time with a community of like-minded people." "Sharon and Jon provide a framework that creates an instant community with the other members of Zelement Club, while also maintaining the freedom of unregimented days. On my first day Sharon gave me my scooter (already rented on my behalf), as well as a lesson on how to use it. She showed me around the local community, including cafes, the best place for surf lessons, the best yoga studio, best place to rent beach chairs and drink coconuts, etc. Nothing was mandatory and there was no scheduled itinerary; you could follow the Zelement recommendations or not according to your preference. Thanks to the support of Jon and Sharon, within a couple days I felt like a local, totally independent on my scooter, sometimes waking up early to catch a yoga class or surf lesson, spontaneously meeting other members of the group in cafes, or just chilling on the beach. If anyone wanted to sightsee around the island, Sharon and Jon were happy to provide information and assistance booking transport. If you preferred to stay in the local area at a more relaxed pace, that was fine, too. Zelement Club is travel as it should be, ideal for the independent person who enjoys spending time with a community of like-minded people. And who enjoys laughing. I laughed to the point of tears multiple times on my trip. Ultimately I made lasting friendships and truly feel like I am now part of the Club. " "Sharon and Jon have a warm, welcoming and truly Zen vibe, and they attract others like them to Zelement Club. They make travel a breeze, while connecting you to the wonderful communities in the Zelement Club locations." "I'm not a fan of group travel, which usually includes strict itineraries, some type of recorded headset tour, a guide with a megaphone, large umbrella or some other bright, identifiable object that screams 'I'm a travel guide with a bunch of tourists!' I can promise you Zelement Club is none of these things. Sharon and Jon will never make you follow them around as they hold a large umbrella and point out sites. I also have to confess that Sharon and Jon are two of my favorite people in the world, so there was no question of joining them on their Zelement Club adventures. I've joined them in Colorado and Bali, both trips exceeded my expectations! My snowboarding improved greatly in the Cooper Mountain pow with Sharon and Jon providing the type of encouraging and thoughtful customized coaching that really boosted my confidence on the mountain. They did it again in the serene setting of Canggu, Bail, however this time the obstacle was getting from point A to B on a scooter. I was incredibly apprehensive about scooting myself around, however with a few lessons from Sharon and Jon along with their patience, kindness and encouragement I was zipping through Canggu on my own!